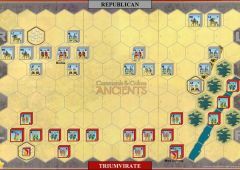 In October 42 BC the forces of the second Triumvirate under the command of Marc Anthony and Octavian clashed with those of the Roman republic commanded by Brutus and Cassius. 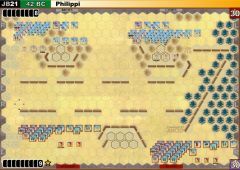 The republican army occupied the high ground west of the city of Philippi and anchored their left flank on the marsh ground to the south. 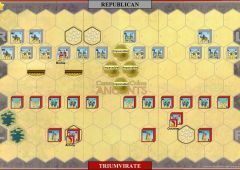 The Triumvirate forces needed a quick victory as the surrounding countryside couldn’t support their army for long and republican supremacy at sea prevented supplies been shipped in. In an attempt to bypass the republican positions Anthony’s troops began construction of a causeway through the marshes. (Represented by the river in the map above) However this was discovered by Cassius and his forces constructed a traverse dam to prevent further work on the causeway. 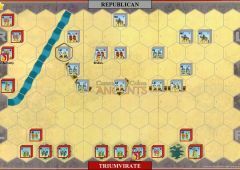 With work on the causeway halted and time running out marc Anthony ordered his troops to storm Cassius camp this was successful believing all was lost Cassius committed suicide. 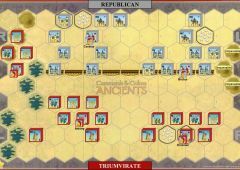 On the Northern end of the battle field Brutus’s forces had routed those of Octavian and stormed his camp the battle ended in a draw as both sides withdrew to camp. Marius Legions Rule is in effect for both armies.